Severe flooding on Ward's Island has led to a plunge in business at the Rectory Café. It will close for good in October. After one of the rainiest springs on record, Toronto is grappling with prolonged flooding. Here’s what the TRCA is doing to keep the damage at bay. Photo by Sean Tamblyn via Toronto Island Park. The Rectory Café on Toronto’s Ward Island overlooks a large, marshy pond—a new addition this year to the tourist site. The wetland is the result of a particularly rainy spring that saw double the rainfall compared to the same period last year, and by May 31 water levels in Lake Ontario reached the highest they’ve been on record. About 40 per cent of Ward’s Island has receded into the encroaching lake. During the calm after one of the season’s many rainfalls, the flooded island, with its Toronto skyline backdrop, makes for an eerily beautiful image. But the impact on the environment, and the people who rely on it, can be devastating. Zorah Freeman-McIntyre, the chef and co-owner of the Island Cafe told CBC last month about the drop in business. “Islanders have been supporting us a lot, which is great, and city workers have been coming by…but the bulk of our traffic is tourists, and people can’t come across,” he said. The Rectory Café will close in October, and has seen a drop in business. Indeed, damages from flooding create a significant financial burden on small businesses, homeowners, and the economy in general. The 2013 summer storm in Alberta cost $1.7 billion in insured damages, making it the priciest natural disaster in Canadian history. Property damage from Toronto’s rainstorm that same year cost $850 million, and another Toronto storm in August 2005, cost $671 million. Damages from the record rainfall this April and May have yet to be tallied. 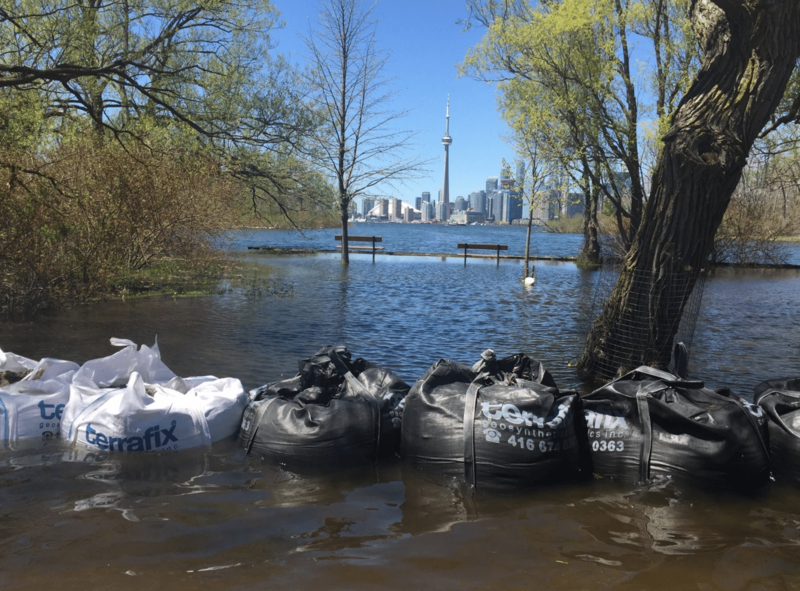 The waterlogged state of the Toronto Islands and waterfront this spring is due to lake-related flooding—the result of prolonged periods of rain, often in spring on top of a snow melt. High lake levels, and the flooding that comes with it, can persist for months. The other type of flooding common in the GTA is riverine flooding. When all is running smoothly, Toronto’s extensive ravine network acts as a natural drainage system to protect against these floods. When heavy rain falls in a short period of time, the ground becomes saturated with water which can’t be absorbed into the earth fast enough. The runoff that results funnels into the ravines’ many capillaries, which carry the water down to Lake Ontario. But urbanization has left swaths of impermeable concrete in place of rain-absorbing green space. The result is huge amounts of runoff that stress our urban rivers. When that system becomes overwhelmed by rain—which it frequently does—surrounding properties and low-lying areas near rivers and streams pay the price. “Urbanization has to occur in a way that allows the ravines to fulfill their natural function,” says Rehana Rajabali, an engineer with Toronto and Region Conservation Authority (TRCA) who specializes in flood-risk management. But historically, that hasn’t always happened. Photo via Toronto Island Park. It doesn’t help that most of the city’s sewers aren’t equipped to deal with the onslaught of extreme weather brought on by climate change. Developments built before the 1980s (and before the region had effective stormwater management programs) have sewer systems designed for two– or five-year storms—weather events that have a 50 per cent and 20 per cent chance of happening, respectively, each year. “The problem is that we’re getting a lot more intense storms than we were when these systems were built,” says Glenn MacMillan, senior manager of water and energy with TRCA. “The science is showing we’re getting 10 per cent more rain per year—not a huge amount more, but it’s how we’re getting the rain that matters.” Rather than getting small, 5–10 millimetre rainfall events, it’s more common now to see droughts and then pummelling rain in a short period of time. Since the TRCA’s inception, the region’s municipalities have restricted building on floodplains. All new developments, meanwhile, no matter where they’re located, are required to account for stormwater on their lands. “When you have a development, you’re creating new impervious areas which alter the water balance,” says Sameer Dhalla, associate director of engineering services at TRCA focusing on restoration and infrastructure. “You have less water infiltrating [the earth], less water evaporating, and more water that runs off the landscape. This increase in runoff can cause flooding, erosion, and can create water pollution problems.” Adding green roofs, permeable pavement, and infiltration trenches to properties can help avoid these problems. Still, there are 43 sites in and around Toronto deemed “flood vulnerable area clusters,” most of which are located in historic urban areas that predate floodplain-management plans and stormwater-management practices. “For these existing flood vulnerable areas, we need to look at larger remediation solutions,” says Dhalla. 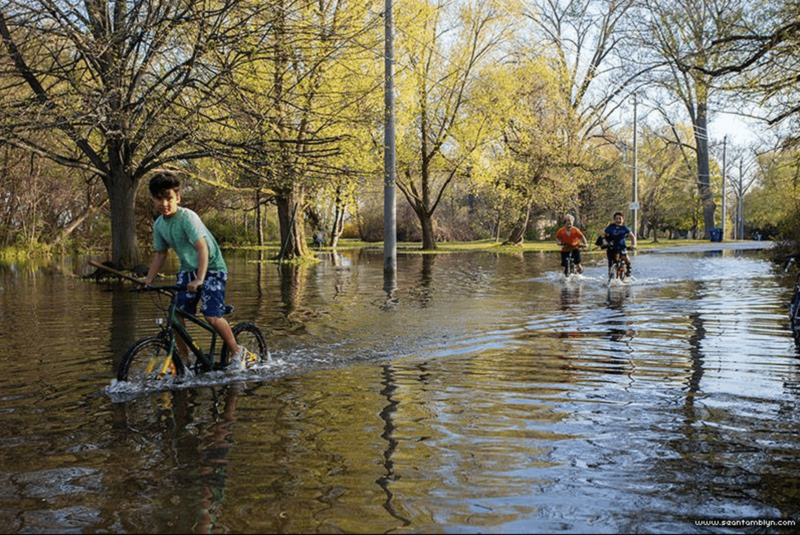 Those solutions involve ambitious, long-term projects aimed at protecting entire neighbourhoods from riverine flooding and avoiding another Hurricane Hazel–like calamity. The Corktown Common is one example of large-scale flood remediation. There, a 8.5 metre-high landform, cloaked with grassy hills and saplings, protects the West Don Lands in case of flooding from the Don River. The landform is one phase of a larger effort—the Don Mouth Naturalization and Port Lands Flood Protection project—to keep widespread flooding at the mouth of the Don River at bay. Another piece of the massive project is modifying the mouth of the Don River. The stretch was artificially straightened in 1886 to make space for boats to pass through and to divert sewage and waste water into Ashbridge’s Bay Marsh. But the plan, dubbed “Don Improvement,” made flooding worse. Now, Waterfront Toronto, in partnership with the TRCA, plans to restore the mouth of the Don to its more natural state, complete with recreation space, habitat creation for species, and, most critically, flood control measures. Indeed, building a number of benefits into one project is a core principle of the TRCA’s “Living City” mandate. Corktown Common, for instance, shows how well-designed green space can offer recreation space and conservation as well as rigorous flood protection to vulnerable parts of the city. It’s something earlier flood control measures failed to strive for. Dam building, for example, proved useful for stymying torrents, but dams can harm species populations and habitats. CORRECTION: 11:50 PM, JUNE 26 This article has been updated to reflect the correct pronouns for Zorah Freeman-McIntyre, to correct which business will be closing, and which business Zorah Freeman-McIntyre co-owns. Torontoist regrets the errors.